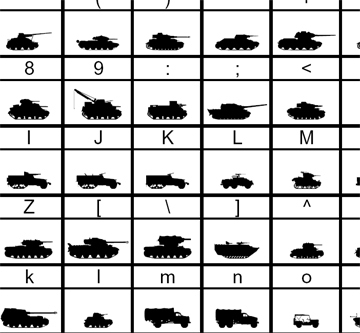 WWII tank silhouette font. Includes: 2 fonts, with the images facing in opposite directions, a Windows Helpfile with names of the tanks, text file on how to use the font files, and a license agreement. Thomas Stevenson 8 9 9 The font is very well done and can be scale to any standard font size. The licience agreement that comes with the download however is very restrictive to point of uselessness butauthor indicates that it can be used freely if not resold.